It was a Sunday. I was with Jon and supposedly also with Berg for the Free Photography Workshop conducted by the Cebu Photographer’s Club in SM Cebu Conference Hall. After the workshop, we were off to have lunch. I have been craving for Japanese food for quite sometime now. 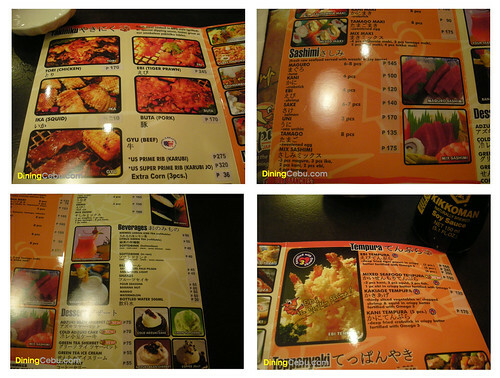 I haven’t been to a Japanese restaurant in Cebu since my Tokyo trip. 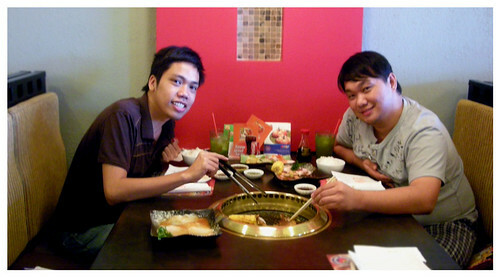 Tempura Japanese Grill in SM Cebu Northwing was just the perfect place to eat. Accomodating staff, nice ambiance, nice interiors, nice smell… and… and… kaboomm!!! All of that turned into a nightmare when their store supervisor or manager advised us not to take photographs. I was confused and at the same time about to explode and leave the restaurant right there and then. Luckily my craving for Japanese food and thoughts of a sumptuous Yakiniku meal a few minutes from now was reason enough for me to stay. I really don’t understand their policy regarding taking food photos. We can understand if they disallow us to take pics sa ilang interiors but not allowed to take pics sa food nga among gebayaran? Haler? Ok lng mo? Anyway this is not the venue to rant about our bad experience from Tempura Japanese Grill restaurant in Cebu (sa ilang manager/supervisor rasad ha, to be fair with). So moving on to our great selection from their menu. Since my last experience in Japan of their Green Tea, I prepared myself for something bitter and more of the tea rather than the Citrus or Lemon. 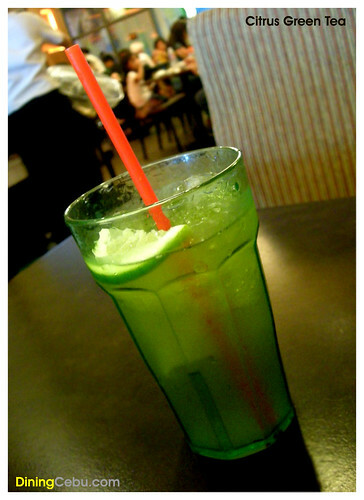 Tempura’s Citrus Green Tea is the typical Philippine version of the Ice Tea. I was a bit disappointed that it wasn’t more of the tea but at the same time happy nalang din kasi I needed a little refreshing sweet drink after that incident. I give this an OK vote. Did I mention that this is refillable? So enjoy it as much as you can on your visit to Tempura. FROM WIKIPEDIA: Sashimi is a Japanese delicacy primarily consisting of very fresh raw seafood, sliced into thin pieces with varying dimensions depending on the type of item and chef, and served with only a dipping sauce (soy sauce with wasabi paste and thinly-sliced ginger root or ponzu), and a simple garnish such as shiso and shredded daikon radish. Tempura’s mix sashimi is composed of 3pcs Maguro (tuna), 3pcs Ika (squid), 2pcs Kani (crabstick), 2pcs Ebi (shrimp), 4pcs Tamago (sweetened egg). Okey raman cla tanan. Everything was fresh, juicy, and taste just the way it should be. There was nothing out of the ordinary from this sashimi. Aw except diay nga, sa ako napud ge-clarify ni Berg nga “Mix” ra gyud na ug wala ko nagkulang ug tuplok sa letters. Shortage lang gyud cguro ug “E” and “D” sa Tempura! 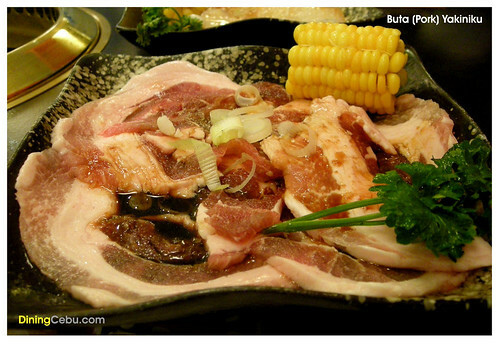 FROM WIKIPEDIA: Yakiniku, meaning “grilled meat”, is a Japanese term which, in its broadest sense, refers to grilled meat dishes. The following day, I was with a friend for lunch. OMG!! Sa Tempura pa gyud mi nangaon! Dili sad ko makareklemo ug sulti niya kung unsay experience naku yesterday kay dili mi close. Hay naku magkita nasad mi balik adtong tawhana?! Hmmpphhh… Nakaremember pa gud ang waiters and waitresses nga nag serve namo yesterday. Pero weird lang, wala gyud naku makit-i ang store supervisor/manager. Asa kaha to cya noh? Day-off? Got fired? Hmmm the plot thickens… Grabe raba tong yaw-yaw among gesulat sa ilang customer satisfaction form! On my next visit pangitaon gyud to naku cya bah! Here’s a quick review on what I ate that day. No pictures lng kay maulaw ko sa akong kuyog hehe. Even without the claimed health benefit, I can eat 5pcs of this (that is if I can pay for it hehehe). This is one of my favorite non-pork food of all time! I like the crispy and generous amount of crumbs and the tenderness of the shrimp. I like this better than in RRK. Highly Recommended! Nothing special. Just your typical california maki. But still a classic choice. EBI SALAD MAKI – inside-out roll maki with mango and asparagus topped with shrimp salad and lightly rolled in ebiko, nori flakes and sesame seeds. Another must try! I don’t exactly remember the taste but daghan akong nahurot ani. Dili man gud cya ordinary for me. Then there’s a lot going on sa presentation. Love it! Love it! Love it! There is really something special about this mildly sweet soy sauce, and the raw egg and the i-dont-know-what-type of mushroom (I’m guessing shitake mushrooms to) on top of the rice. Another must try and highly recommended Japanese food. Tempura Japanese Grill restaurant in Cebu offers a wide selection of Japanese food. From sashimi, sushi, maki, teriyaki, teppanyaki, to rice bowls, ramen, and most importantly yakiniku. Generally I love Japanese food and I love everything I have tasted in Tempura. Even with their so-called “no picture taking” policy, ganahan ra gihapon ko mobalik because their food is so delicious and so nicely presented. Magtago-tago lang gud gihapon ko ug picture kung badlongon ko. I would highly recommend this place because of their food. I will surely be back (hopefully) soon. This should belong in my top 10 list of Cebu restaurants. Hala! Maghimo kaha ta Shel & Berg ug atong favorite Cebu restaurants? Whatchathink? CPC member diay ka fedge? nice photos ga laway kog tan-aw. @Fedge: Pasar kaau nindot! ahh kay sir michol sanchez na workshop? Hahaha. naana pud akong nawng ha. no permission again! Yeah, it wud’ve been 5 spoons for me if not for that retarded manager! No Picture Taking???? Seriously? Unsa ni concert? 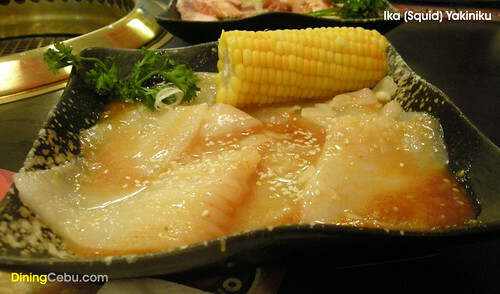 Anyhoo, i enjoyed the Yakiniku, but i have a feeling i overcooked my Ika. Ngega manoy ahh!!! published man iya pic. hehehehe. If mangita ko ug ka-anan kaw ako pangutan-on kay xport man ka parti sa kaon. NOH!!!! to berg and iya friends.. nindot kaayo inyo website.. mau pud inyo reviews/comment/rant.. post pa mo daghan. CONGRATULATIONS!!! @jkoy: Hi! thanks for visiting our site… yes we will (try to) post regularly for you guys… balik-balik nya! @yang: hoi nayabag na ai! well nagsabot nami ni Shel noh…sa Koreen’s daw hahaaha.. dili oi ambot yang i dont know where.. pero im guessing sounds lyk “Koreen’s”… Go green ka dyan! mao unta ug mokaon kag dahon-dahon nga parehas raba tang ignorante ug gulay! @shel: hala nag cge balik2x ang Koreen’s basin ma pick up ni ron atong blog sa Koreen’s! hala balik nasad! Btaw Jeff, try nato sa Koreens courtesy of Yang! @yang: hala manoy kaluoy nimo manoy… sos tawn ohh nagpacute-cute tawn ang iro haha… sit! @shel: hmmm ambot murag ka 20 na cguro ko balik2x ug padungog2x ni yang ana wala man ni kagat! ill borrow a line from guenevere ha “Gi imbitar ka? or You invited yourself?” Good Luck! I thought that you would have a bit more feedback posted but anyway, great blog. I really liked your blog! I have to say it is hard to come by blogs with great information like yours. It is definitely bookmark worthy! Thanks for putting it together. Peace! @shel: shel? japanese store ba to adtong gi adtoan? @yammi and jeff – naa to Japanese store sa una but not sure ko ug open pa to kay mura man tug cgeg ga-sale. Naay Chinese store nuon didto duol sa Red Moon hehe (simanga sa akong tubag!). Daghan mga Korean shops diri Cebu compared to Japanese, but based sa akong nabantayan most groceries (SM even C-Mall) carry Japanese products in their groceries baya. It’s a matter of recognizing the characters on the packages hehe. I don’t understand the meaning sa mga words ha but I recognize the differences between Chinese, Japanese, and Korean mao na makaila pud ko nuon. 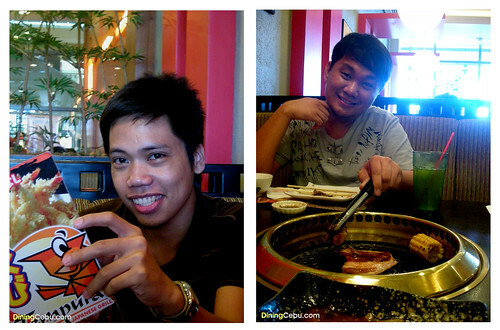 I’ve been to cebu last march 2009.Me and my husband decided na magfood trip and because i know maraming nagopen sa cebu na bagong restaurant like the terrace and the sm northwing. tsaka nga pala thank u sa blogs and photos nyo.this is a good reference for everyone na mahilig mag food trip. Ou-yo-yu what a nice site!